The SouthGate site lies between the River Avon and the southern defences of Roman and later Bath. 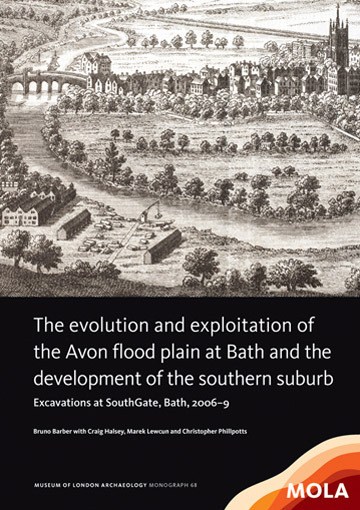 This volume describes the evolution of the local Avon flood plain from the Pleistocene to the 20th century. Highlights include a large Early and Late Mesolithic lithic assemblage, Anglo-Saxon extramural activity, the Norman and later development of the Southgate suburb, and an artificial watercourse which eventually became an open sewer known as the Bum Ditch. Later periods provide glimpses of a low-status area that provided goods, food and services to the more familiar wealthy Georgian city, the ‘Baedeker’ air raids and the Beatles. MOLA 2015. ISBN 978-1-907586-28-6. Hb 300pp + CD-ROM. 194 bl&wh and col ills. This volume is number 68 in the Museum of London (MOLA) monograph series. Collectively, these monographs are a remarkable record of that organisation’s timely publication of archaeological excavations, not often matched elsewhere. An efficient, highly professional production by an experienced team, this is a major addition to the historiography of Bath with interesting undigested implications for the topography and intramural city and its defences. There is much here of interest to anyone fond or urban forms and changing fortunes of historic suburbs.